There is currently just the 1 ferry route running between Sicily and Tunisia operated by 2 ferry companies – Grandi Navi Veloci & Grimaldi Lines. The Palermo to Tunis ferry crossing operates weekly with a scheduled sailing duration from about 10 hours. 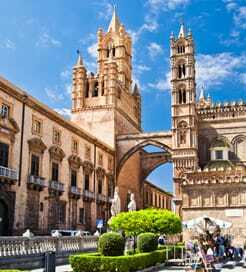 Whilst we’ve taken great care to ensure the information on this page is correct, as the frequency and duration of crossings on all routes can vary from time to time we’d advise that you get a live quote for current availability on this Sicily Tunisia crossing between Palermo and Tunis. Tunisia is a country in Northern Africa with a coastline on the Mediterranean Sea coastline, bordered by Libya to the Southeast and Algeria to the West. Although Tunisia is a relatively small country on the North wedge of North Africa, its packed with so much history and diverse natural beauty. 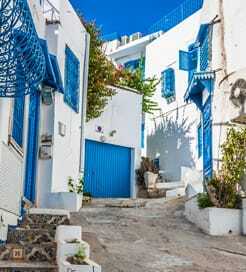 With a gorgeous Mediterranean coastline, Tunisia is a prime location for sun, sand and sea. Beyond the beaches, its distinct culture and beautiful historic sites as well as the Sahara desert with rolling hills of soft sand will ensure you enjoy a beautiful time in Tunisia.